Sometimes my sports trips happen without any planning at all. Such was the case this past weekend when my wife, who enjoys the world of art infinitely more than the world of sport (they do say that opposites attract) mentioned that Yale University was home to a renowned art gallery. 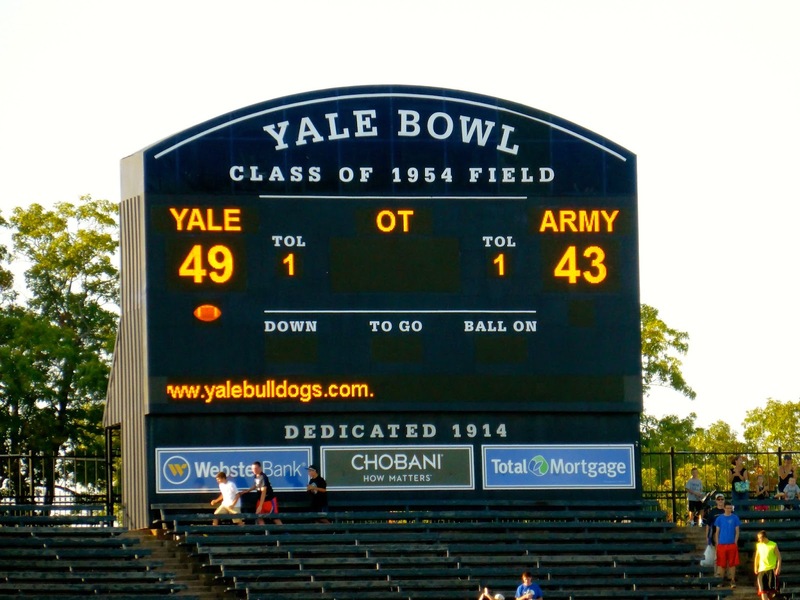 Yale is also home to a very old football stadium and as luck would have it, the Bulldogs were hosting Army in a Saturday afternoon tilt. So I took Metro North up to New Haven ($16.25 for a 2-hour ride) to join in the celebrations of the Yale Bowl's 100th anniversary. The stadium is a good three miles from the train station but there is a free Yale shuttle that gets you halfway there. I walked the remaining 20 minutes or so, surprised at how quickly the clean neighbourhood surrounding campus became relatively rundown. 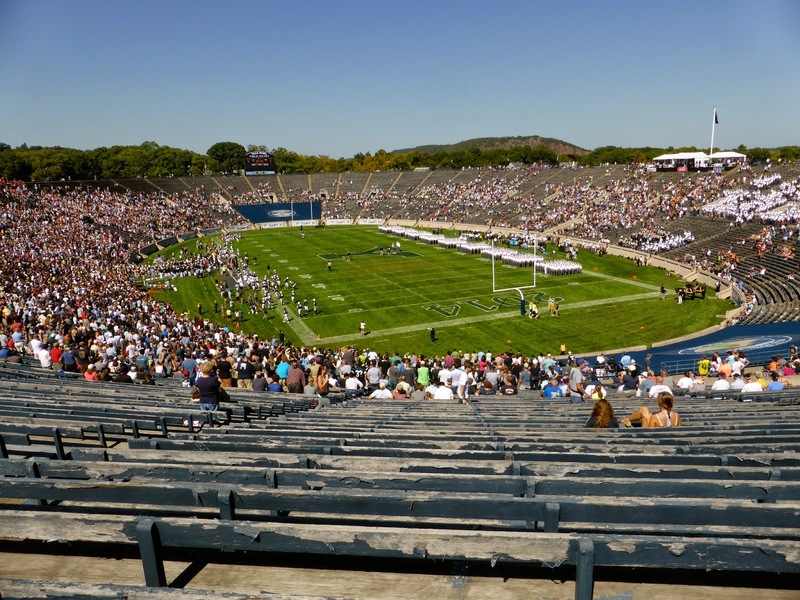 The Yale Bowl is north of downtown, surround by forest, so nearly everybody drives or takes shuttle buses from campus; I was the only fan making the trek on foot. The stadium is built into a hillside, so exterior shots are not very good. The portals to the seating bowl are really all that you see poking out of the hillside. I arrived about 10 minutes before kickoff and went looking for the box office. It was located at the end of a long path that had temporary fencing blocking you from the stadium. However, the fencing was easily movable and somebody had made an opening. The person in front of me used it to get in and so I followed, completely unnoticed as at that very moment, Army paratroopers were landing on the field with the game balls and everyone's attention was skyward. Sorry Yale, but you are a rich university with over $20 billion in endowment, so I don't feel guilty for sneaking in and saving myself $20. I made my way to the topmost row to snap a picture. As you can see above, the benches are about 100 years old as well. There isn't much here, all of the concessions are outside the seating bowl and very basic. There was a small exhibit on the history of the stadium (the top photo is a program cover from the 1950s) but otherwise very little to talk about. It was a beautiful afternoon for football, but of course, I had forgotten sunscreen, so I made my way to the shaded area and grabbed a seat. With Yale playing in the FCS while Army is an FBS team, I expected a blowout much like what I had seen the previous weekend in Buffalo. 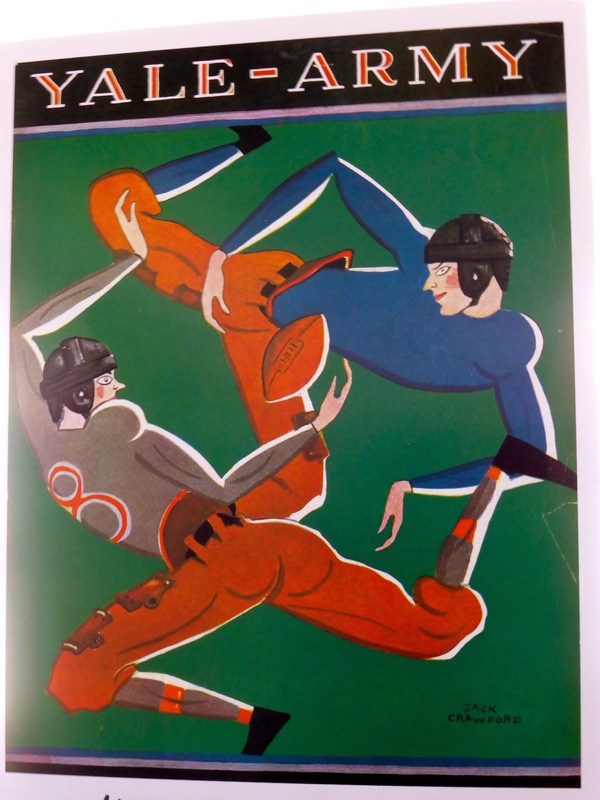 Instead, I witnessed the best college football game I have ever seen (not saying much as I have only seen 7 of them). Both teams punted to begin the afternoon, then followed up with touchdowns on extended drives that took us to the end of the first quarter. One of the highlights of seeing Army play is watching their cheerleaders do push-ups after every TD (below). Both teams failed to score on possession number 3, and then followed up with touchdowns, including one for Yale running back Tyler Varga, whose hometown is Kitchener, Ontario. On the next drive, Army moved 70 yards in just 3 plays, with QB A.J. Schurr (below) running 43 yards for the touchdown to make it 21-14 at halftime. The third quarter was where things got crazy. 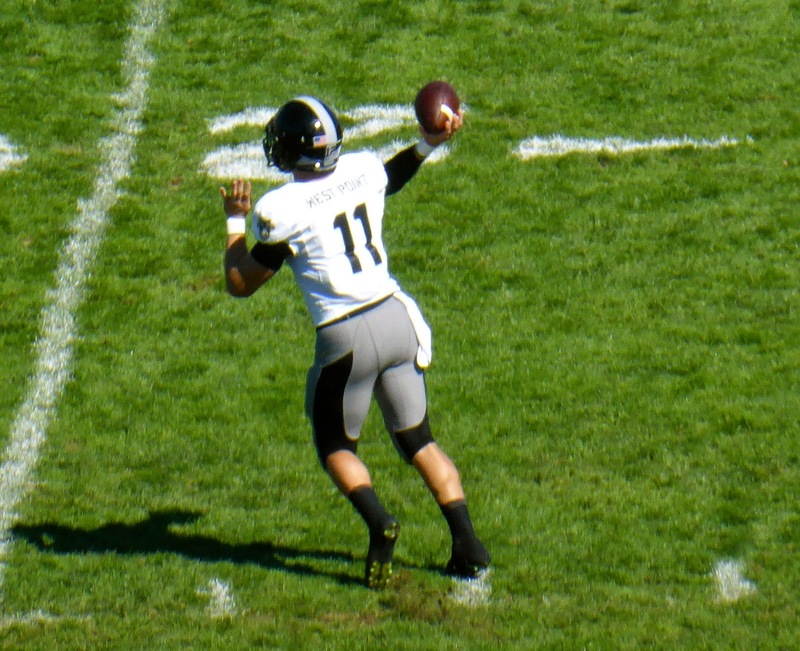 Yale QB Morgan Roberts was intercepted just 90 seconds in, with Jeremy Timpf returning the ball 45 yards for a touchdown to give the Black Knights a 14-point lead. Yale went three-and-out on their next drive and then the turning point came. Punter Bryan Holmes was hit as he kicked and the penalty allowed the Bulldogs to retain possession. They used the reprieve to drive 62 yards, capped by a 15-yard run from Varga. A surprising 2-point conversion was successful and the game was far from over, with Yale back within 6. 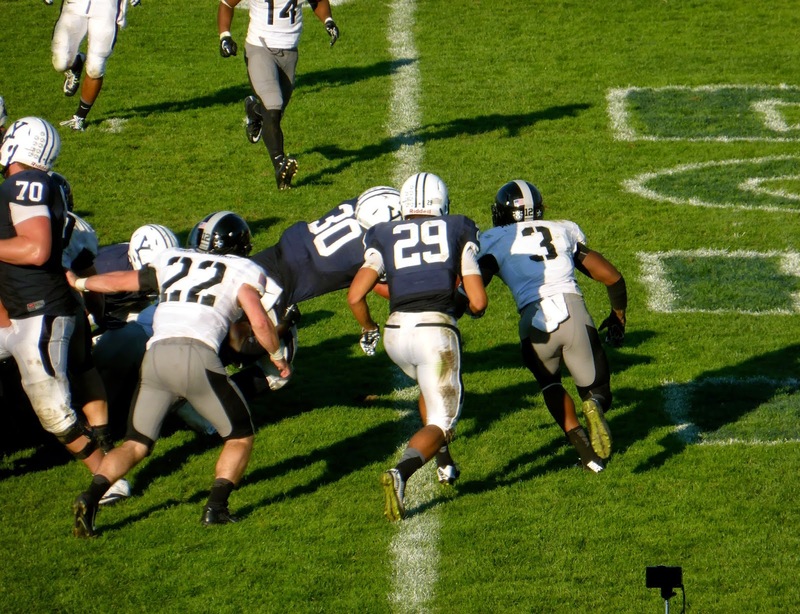 On the first play of the ensuring Army possession, Schurr was injured, one of several Black Knights to leave the game in the second half. He was replaced by Angel Santiago, who promptly ran for a 53-yard score. Army also added a 2-point try to regain the 14-point advantage. But Yale was not to be deterred, with Roberts finding Ross Drwal for a 22-yard touchdown and, after Army punted, Varga scoring his 3rd TD of the day on an 18-yard scamper. The score was 36-36 after three quarters, which had already taken over 3 hours, a combination of the injuries and the incessant media timeouts. Such is life in sports these days, where those at home are inundated with commercials they can easily avoid, while those at the stadium must endure long periods of tedium with only a dying smartphone to distract them. But I don't want my complaints to detract from what was still an inspiring afternoon. On the first play of the fourth quarter, Santiago snuck in from a yard out (above) to make it 43-36 Army. Then both teams suffered through a couple of ineffective possessions before Yale took over on the Army 45 with 4:35 left. Varga and Roberts ran the ball on 7 of 8 plays with Varga tying the game on a 10-yard run that saw him bounce off numerous tacklers to take it to the house. Army still had enough time to score though and they moved the ball to the Yale 25 with just 5 seconds left. Daniel Grochowski came on to try the 42-yard field goal to win it, but he missed wide right. Or left. I couldn't tell from where I was sitting but the result was overtime! The four quarters had taken nearly four hours, but we were not done yet! 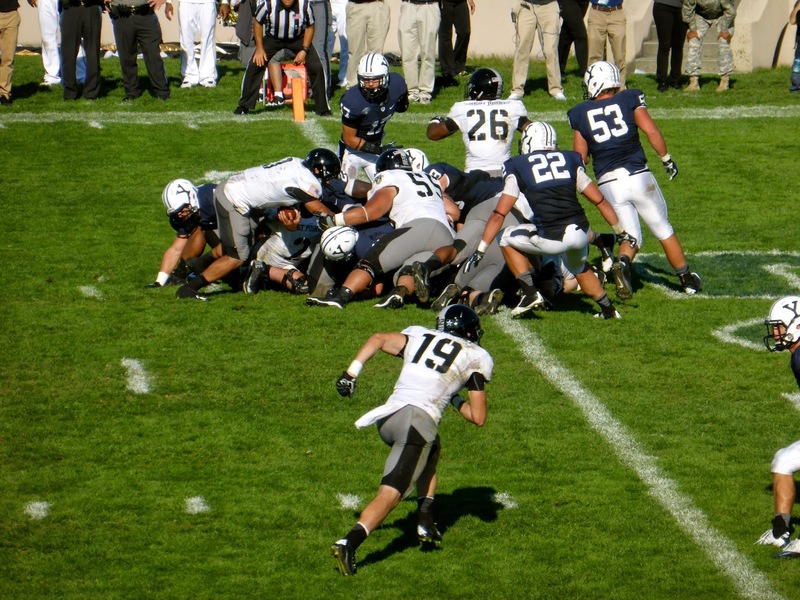 In college football, overtime sees both teams starting on the opposing 25 until one team scores more than the other on that possession. Army won the coin toss and was unable to score a touchdown despite a first and goal from the 7. Grochowski came out to kick the gimme field goal but missed again! Yale had a chance to win and they weren't going to risk an interception. They ran the ball six times, with Varga taking it in from 3 yards out (above) to complete the amazing upset. It was his 5th touchdown on the day, which may or may not be a record for a Canadian in US college football, but it did get him the FCS Offensive Player of the Week Award as he totalled 185 yards on 26 carries. It was the first Ivy League win over an FBS team since 1986 and the game was featured on ESPN that night and on NFL countdown. Not bad for free if you ask me. As soon as Varga scored, fans stormed the field to celebrate with the team. It was the first time I had seen this, and it was fun to watch these youngsters enjoying the biggest win for the school in many years. After the celebration died down, all fans were allowed on the field, so I was able to grab a panorama shot from the end zone. Really a beautiful place for being 100 years old. If you haven't been, you should go. All in all, a great afternoon that I won't soon forget. New Haven is a place that few sports fans will visit, but there are things to see there besides Yale athletics. There are two art galleries with free admission, each with excellent collections, while the nightlife scene is more than just student bars, with several good restaurants. In particular, try the Anchor bar (not related to the one in Buffalo) for a trip into the past. It is not a sports bar but just a place to grab a couple of drinks after the game. I'll be back there when basketball season starts.